I don’t generally like parades because they are too orderly and rigid. I want the freedom to walk back and forth, photograph people and talk to them without having to march for blocks on end without stopping. 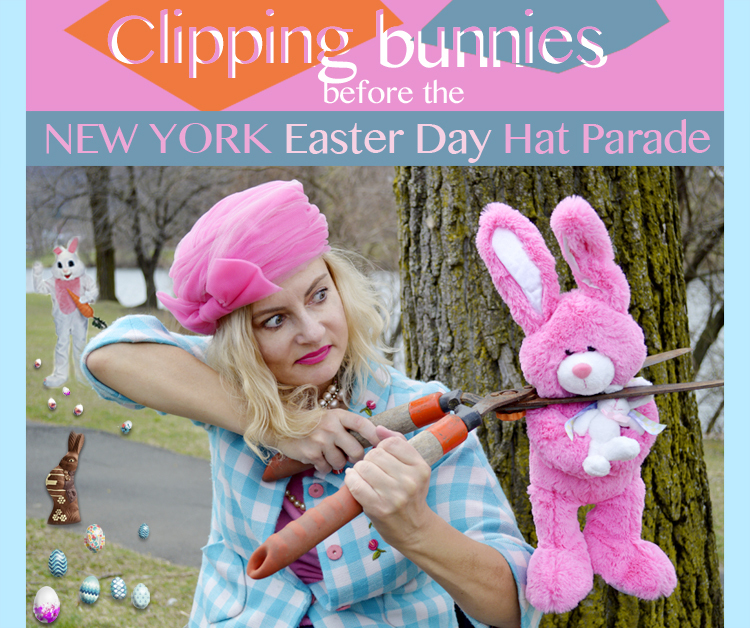 This year, as last, I attended the NY Easter Hat Parade on a beautiful sunny, warm day. 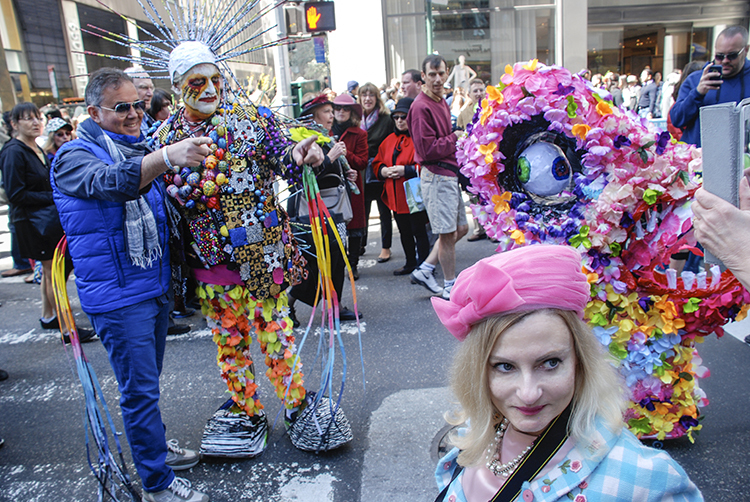 While it was a lot more crowded than the previous year, I was entranced by the menagerie of blinged out dogs and idiosyncratic attendees vying for the click of every DSLR. 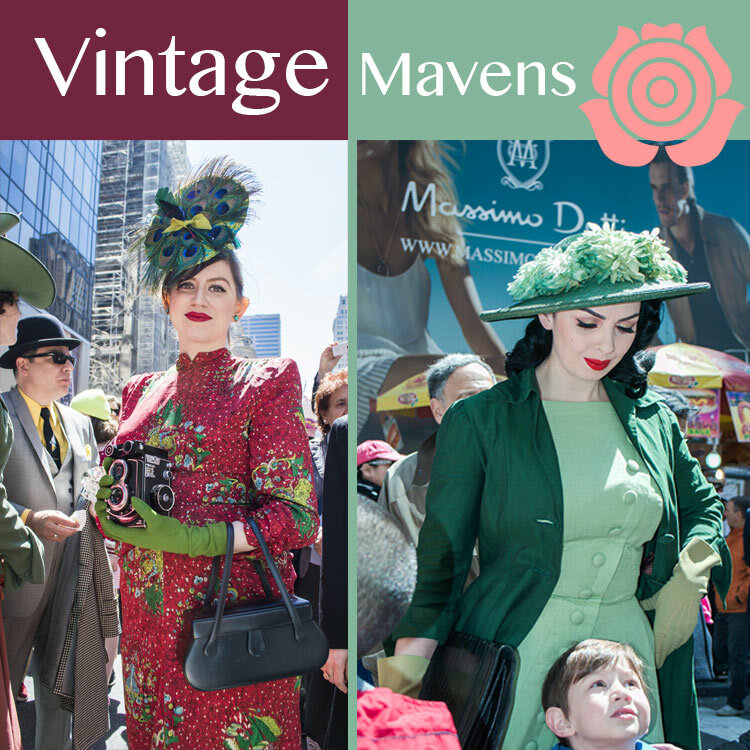 If you couldn’t attend this year, here is a compendium of what I witnessed all afternoon. 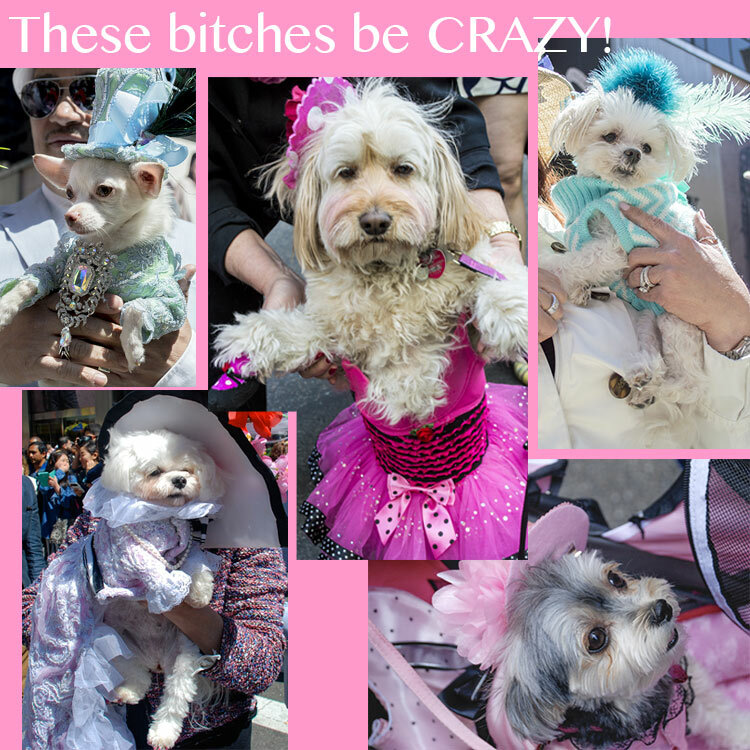 My favorite dog is the one in the center that looked so “over it” and fancies pink blush. 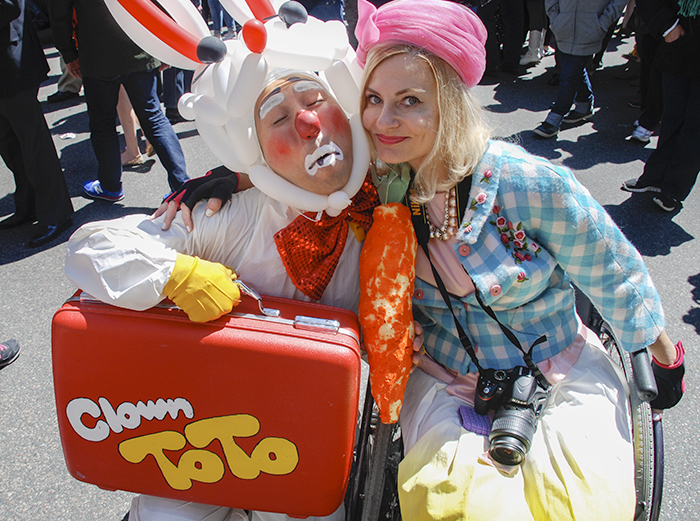 I accosted Clown Toto and told him he needed a career change. He proceeded to cry uncontrollably. 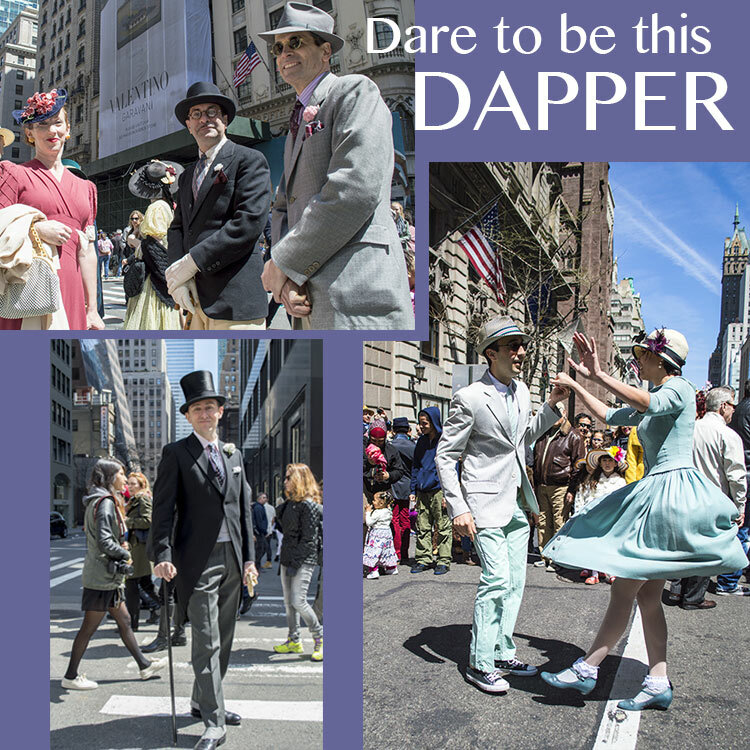 This was the most creative, gorgeous vintage ensemble. 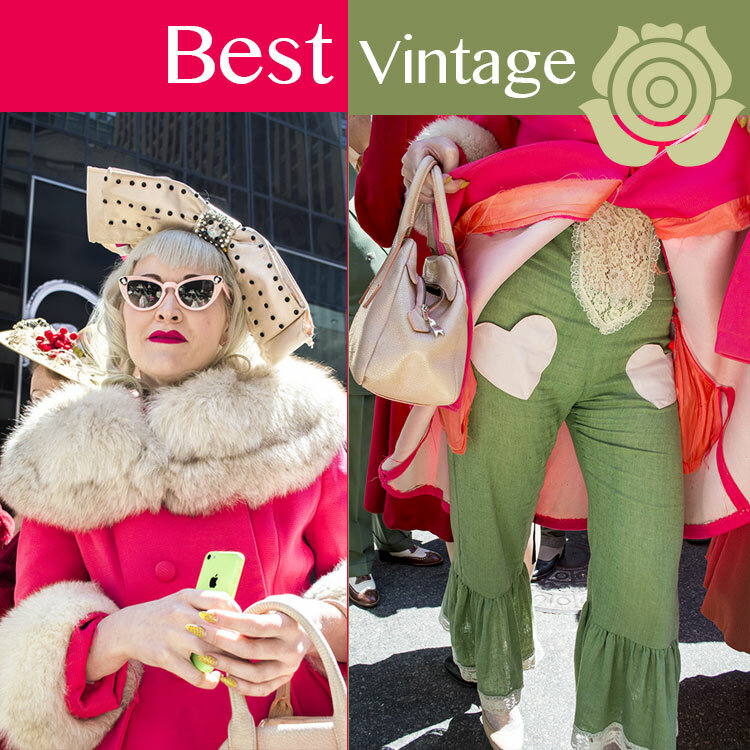 How amazing is her 1920s showgirl head piece and avocado green pants with heart pockets? 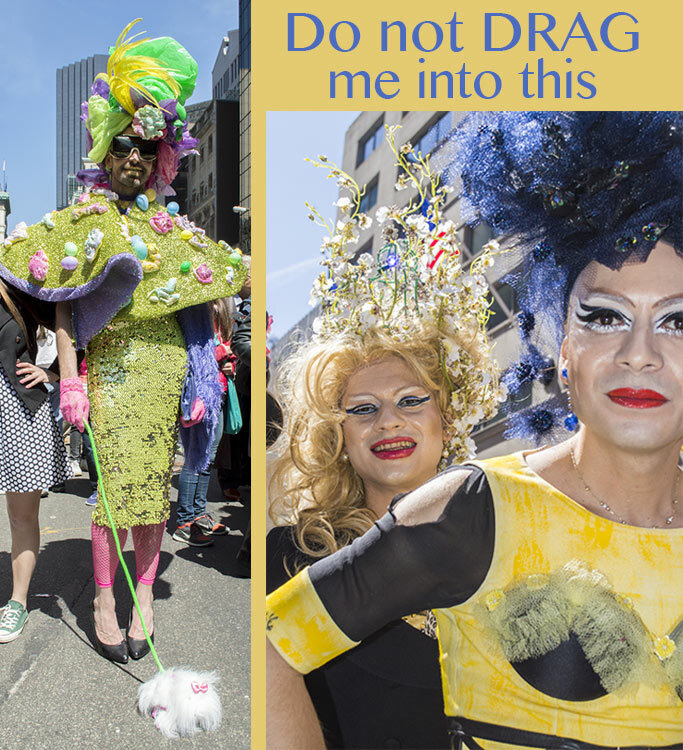 What the hell kind of a parade would it be without guys in drag? Ok this was the most esoteric costume, which still has me scratching my head. What does “The Holy Toast May your TOAST always land butter side up” mean? 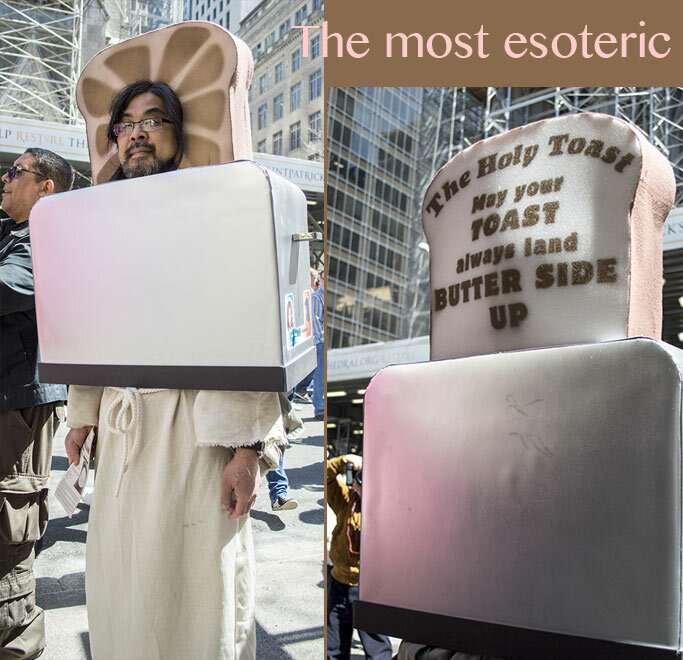 When he turned around, he was in a Messiah costume with Jesus stickers on the side of his toaster oven. He didn’t talk to anyone or smile, but was wearing a styrofoam piece of toast on his head. Then I glimpsed at the literature he was holding in his right hand, assuming it would have something to do with Jesus. But no, it had the word CHALLAH written in big bold text at the top. Is he a challah salesman? Is he Jewish by day and Christian by night? Damn, I wish I talked to the guy. Remember the early 80s new wave band, Devo known for their quirky outfits and tiered glossy hats? 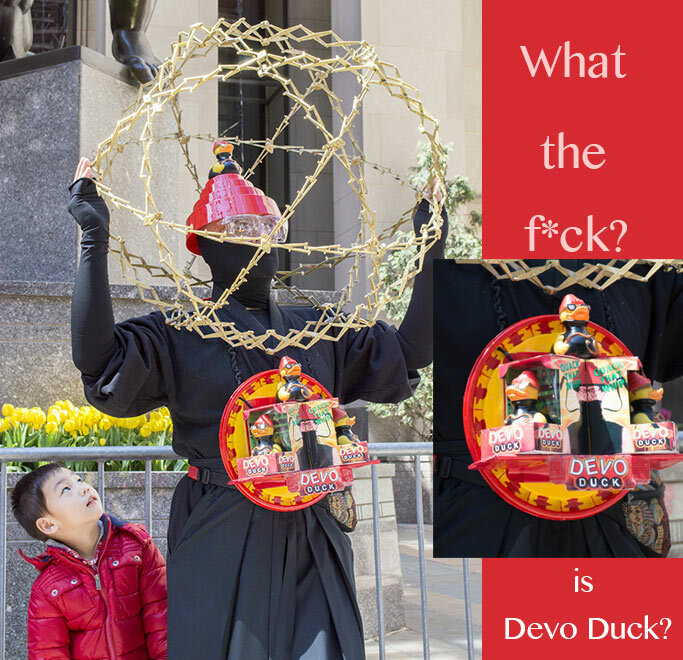 So please explain Devo duck. Maybe ducks rock out to 80s music. Maybe this guy loves Devo and ducks. It could have been a rhino, but he chose a duck. There is no denying this guy’s creativity, so I found his web site, which looks like it was designed in 1995 and hasn’t been updated since. I love the quizzical kid who is practically ready to poke Devo-Duck man. There was something I pondered throughout the day. Why do kids get Easter baskets, while adults look on covetously? Here is a basket that adults should receive from a Jesus-hating-bunny consumed with the proliferation of sin and sweets. 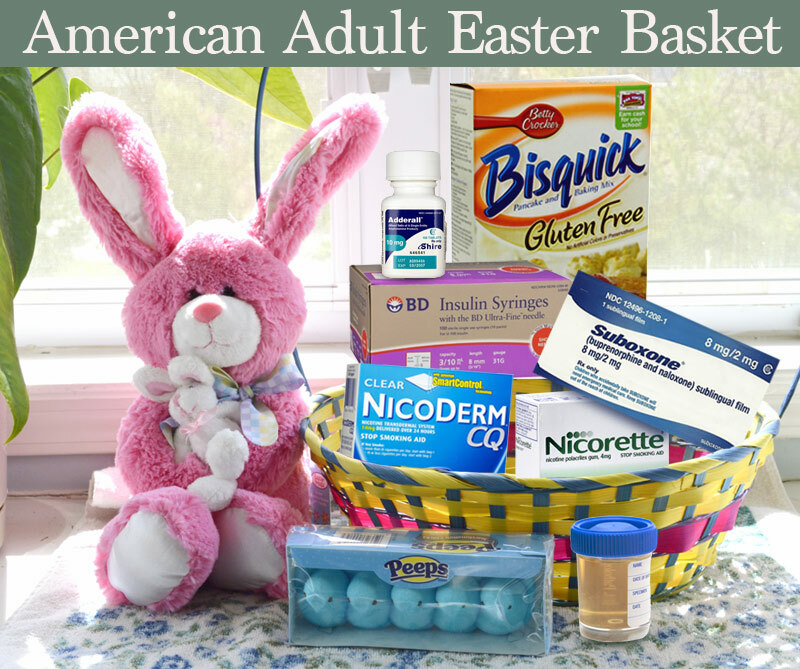 What should you include in a well designed anodyne adult Easter basket? 1. Blue Peeps – These are a great pick-me up in case you don’t have access to your 5th energy drink of the day. 2. Nicoderm CQ – Quitting smoking cold turkey doesn’t always work. Cover your entire back with patches to make sure you get an adequate amount of nicotine into your blood stream. 3. Nicorette Gum – Just in case nicotene patches aren’t enough, chomping on gum will quickly release even more chemicals into you body. 4. BD insulin syringes – I can take a wild guess that someone you know has diabetes type 2. These store nicely in any glove compartment. 5. Suboxone – Perfect for those who are not sure whether they want to kick heroin entirely, can now substitute one opiate for another. 7. Bisquick gluten-free pancake mix – Nothing makes me feel happier than waking up on a Sunday morning and eating a stack of empty carbs the height of a 1st grader’s Ikea storage unit. I usually try to factor in a nap around 10:45 am. 8. Urine filled specimen cup – This is perfect when you want to get a job in a Fortune 500 company and you know you will be drug tested. This kit comes with a specimen from a vegan, triathlete who was been juice cleaning for 6 weeks. Finally here are more photos from the parade. Enjoy. Happy Easter to everyone who celebrated on Sunday and a Happy Passover to all my friends and readers. Be well and please stop eating so much damn candy. Feel cheating that Alice’s mad Hatter did not make an appearance. ps. 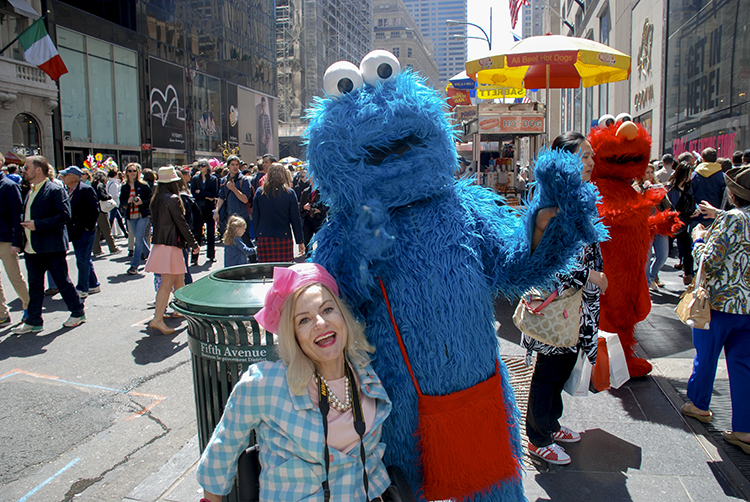 When did Cookie Monster start carrying a purse?